Reithmeier hits the 24.7km mark trailing Brown by 7:35. 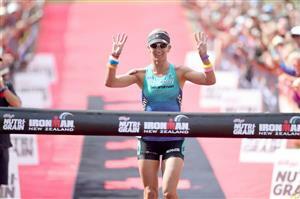 Kessler marches inexorably onward to her fourth IRONMAN NZ win as the Californian reaches the 17.6km point. 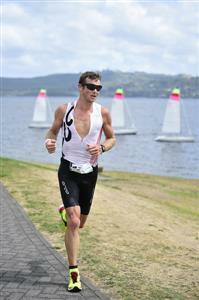 O'Grady still sits fourth at 24.7km 14:48 back with 58 seconds further down his fellow Kiwi Dylan McNeice in fifth. Crawford has just gone through 14.2km but is a massive 17:56 down on Kessler, the long-time leader. Cameron Brown receiving huge cheers around the course from the Taupo crowd has complete 28km of the run, so only a little over 14km remaining. His advantage over Bozzone is now 4:05. Reithmeier is 10:36 behind Brown at 28km looking increasingly secure in his pursuit of the final podium spot. In a competitive battle for third in the women's pro race, Kiwi Melanie Burke holds a 1:59 advantage from the pursuing Stephanie Jones at 14.2km. Either Brown has picked up the pace or Bozzone is slowing down. He has lost nearly a minute to the ten-time champion in the last 3.5km. 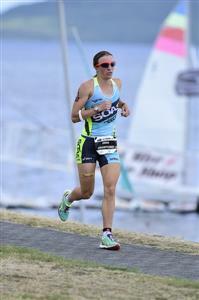 The gap between the lead pair at 31.4km is 4:52. Both McNeice and Schifferle has caught and passed the fading O'Grady who must be praying for the finish line to come as soon as possible as his race is quickly unravelling. Brown's iron-like grip on the race is tightening as course spotters have confirmed his advantage over Bozzone is five minutes. He appears to be running within himself in increasingly windy conditions. 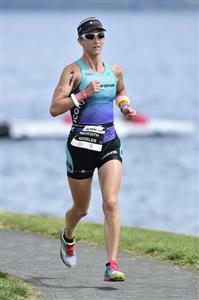 In the race for third spot in the women's race, Burke's advantage over Jones has been slashed to 1:01 at 17.6km. Jones running at 4:24 pace and Burke at 4:37. Bozzone flashes through 35km some 4:56 behind Brown. Gina Crawford along the Lake Taupo foreshore. While Kessler serenely marches on to her fourth IRONMAN NZ crown boasting a 17:47 lead over Kiwi Gina Crawford at halfway on the run. Burke's advantage over Jones in third is now a vulnerable looking 30 seconds. Reithmeier makes the final turn back at 35km some 13:13 adrift of Brown. Brown is now inside the final 4km having reached 38.4km. What a man and what a reception he is likely to receive from the passionate Taupo crowd. Over in the women's race a similarly dominant Meredith Kessler has complete 28km of the run. The coronation of Cameron Brown's 11 IRONMAN NZ is now just minutes away. 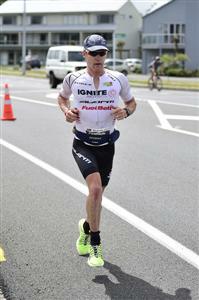 Has any IRONMAN athlete in history quite dominated an event like the quietly-spoken Aucklander? 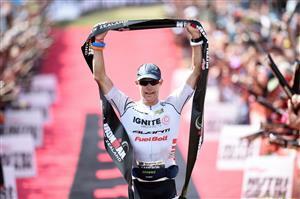 It was 14 years ago when Cameron Brown claimed the first of IRONMAN NZ titles. What were you doing 14 years ago? Cameron Brown stops the clock in 8:22:13. The eighth fastest time ever on this course. The crowd give their man a rapturous reception. Quick update from the women's race. Kessler's lead at 28km from Crawford is now 18:43. The crowd now await the eternal IRONMAN NZ bridesmaid Terenzo Bozzone for what will be his fourth runner-up placing in the event. McNeice trailed Reithemeier by almost two minutes at 38.4km only to pass the Australian in the latter stages and finish some 42 seconds clear. This completes an all Kiwi podium in the men's race. Meredith Kessler is no longer registering marks on the automatic timing system. We will endeavour to find out precisely what is happening as soon as we can. In the tussle for what we believe is third just four seconds separate Burke from Jones at 35km. Kessler records 9:05:45 to hack 2:21 from her previous course record set 12 months ago. We now just await the likely second place finisher in the women's race Gina Crawford. In the men's race Swiss triathlete Mike Schifferle claims fifth in 8:46:32 with Kiwi Carl Read 8:47:40 nipping in for sixth courtesy of a strong run. It was a Kiwi podium with Dylan McNeice producing an outstanding run to pip Australian Alex Reithmeier in the final km to claim third in his debut in Taupo. Sat 7 Mar, 2015 || Check out part 1 of the 2015 IRONMAN New Zealand, race highlights. Sat 7 Mar, 2015 || Check out part 2 of the 2015 IRONMAN New Zealand, race highlights.